All informations about deliveries are unconfirmed, maybe completely wrong. 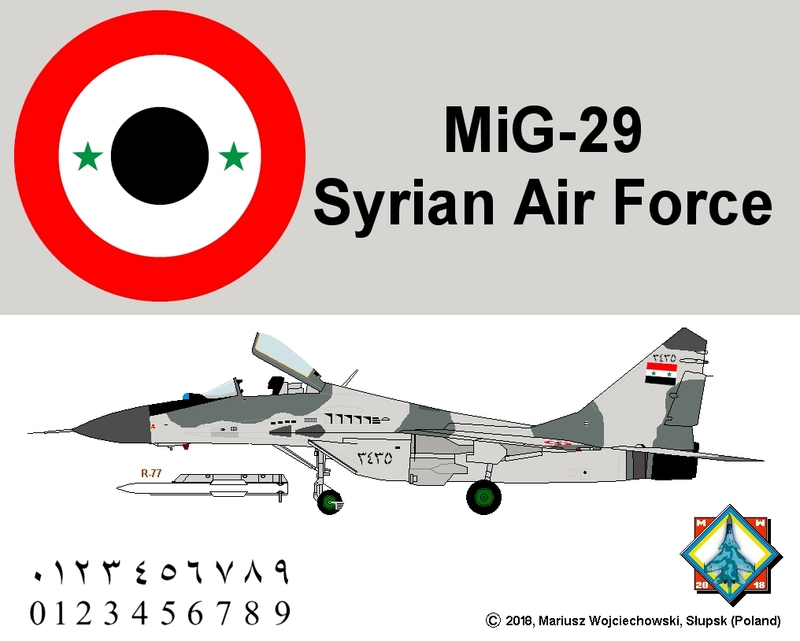 The total number of MiG-29s acquired by Syria is mystery: 22, 32 or 48. 2000: overhauls of 13 MiGs-23, spare parts for MiGs-29 and one new MiG-29 (total: 61 mln USD). 2003: informations about modernization of 14 MiGs-29 to SMT and 6 MiGs-UB to UBT standard - MiGs from first (?) batch. 2005: informations about modernization of 20 MiGs-29 to SMT/UBT standard - MiGs from second (?) batch. 2007/2008: new plans for huge deliveries to Syria, 2010: still rumours about new deliveries. 2010 quote from RSK MiG's annual report 2009: "... in 2009 Syrian MiG were modernized". In 2016 photos of Syrian MiG-29 with R-77 rockets - apparently some MiG were really modernized. So called ‘The Factory’ is the SyAAF’s overhaul and maintenance facility at Neyrab airbase, where all Syrian combat aircraft were overhauled, except Su-24 which were recently overhauled in Russia, in 514th ARZ Aircraft Repair Plant in Rzhev between 2010 and 2013. Civil war in Syria caused to abort a planned deliveries of Yak-130 and MiG-29M2. 697th, 698th or 699th squadrons @ Seen (aka Sayqal) airbase. Some MiGs are permanently detached to T4 (commonly known as Tiyas) airbase (btw captured by ISIS forces in December 2016). Syrian MiG-29 overhauled in 201x Neyrab Airbase, armed with R-77. Schematic drawing based on two-three unclear photos.